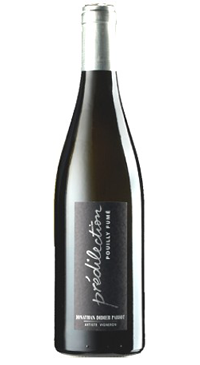 Jonathan is a fifth generation winemaker in Pouilly Fume. He is especially influenced by his grandfather, Lucien, and father, Didier, who made wine in a co-op before eventually starting their own labour of love. In 1990, they built a modern cellar above the hamlet of Les Loges and finally began to bottle their own wines. Pabiot practices organic and biodynamic-inspired viticulture. The cuvee “Prédilection” comes from a very small and prized vineyard. The wine’s aromas are floral, with exotic fruits as well as mineral elements. The wine has a wonderful mouthfeel; it is pure and precise in its freshness. The floral and exotic fruit aromas continue on the rich palate, balanced by flinty minerality and good acidity.